Youngest person to ever receive a Nobel Prize. He is the son of W.H. Bragg. Note that the PhD did not exist at Cambridge until 1919, and so J.J. Thompson and W.H. Bragg were his Master's advisors. 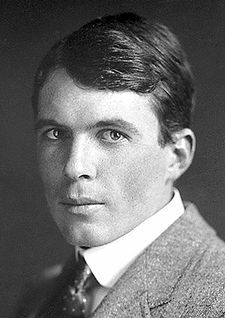 Sir William Lawrence Bragg (March 31, 1890 – July 1, 1971) was an Australian physicist who independently and in partnership with his father, William Henry Bragg, pioneered the use of X-rays for determining the atomic structure of crystalline substances. For their contributions, father and son jointly received the Nobel Prize in Physics in 1915. The younger Bragg was only 25 at the time, making him the youngest scientist to win the Nobel Prize. Years later, in 1953, he was director of the Cavendish Laboratory, Cambridge, when James Watson and Francis Crick discovered the structure of DNA (deoxyribonucleic acid). Bragg was born in North Adelaide, South Australia. He showed an early interest in science and mathematics. His father was William Henry Bragg, Professor of Mathematics and Physics at the University of Adelaide. Shortly after starting school at the age of five, Bragg fell from his tricycle and shattered his elbow. His father had read about Röntgen's experiments in Europe of only a year earlier, and built an X-ray apparatus to examine the broken arm, the use of which was salvaged through a painful program of rehabilitation. This is the first recorded diagnostic use of X-rays in Australia. Bragg was a very able student. At age nine, he was sent to Queens preparatory school in North Adelaide. Two years later he was enrolled in St. Peter's College, Adelaide, where he was recognized for his intellectual accomplishments. In 1906, he went to the University of Adelaide at age 15 to study mathematics, chemistry and physics. He attributed a lack of interaction with his peers during this period with his failure to develop adequate social skills. His father was somewhat domineering, and compelled Bragg to study with him in his office. But in spite of these discomforts, Bragg graduated in 1908. In the same year his father accepted a job at Leeds University, and brought the family to England. Bragg entered Trinity College, Cambridge in the autumn of 1909 and received a major scholarship in mathematics, despite taking the exam while in bed with pneumonia. After initially excelling in mathematics, he transferred to the physics course in the later years of his studies, and graduated in 1911. Among his fellow students during this period was Niels Bohr. Bragg considered C.T.R. Wilson, who invented the cloud chamber for the visual detection of subatomic particles, his most inspiring teacher. After graduation, he lectured at Trinity and conducted research at the Cavendish Laboratory. Bragg is most famous for his law on the diffraction of X-rays by crystals. Bragg's law makes it possible to calculate the positions of the atoms within a crystal from the way in which an X-ray beam is diffracted by the crystal's orderly array of atoms. He made this discovery in 1912, during his first year as a research student in Cambridge. He discussed his ideas with his father, who later developed the X-ray spectrometer in Leeds. This tool allowed many different types of crystals to be analyzed. The collaboration between father and son led many people to believe that the father had initiated the research, a fact that upset the son. Bragg's research work was interrupted by both World War I and World War II. During both wars he worked on sound ranging methods for locating enemy guns. In autumn 1915, his brother Robert was killed. At about the same time William Lawrence Bragg received the news that he had become the youngest person ever to receive the Nobel Prize in Physics, aged 25. Between the wars, from 1919 to 1937, he worked at the Victoria University of Manchester as Langworthy Professor of Physics. He married in 1921, to Alice Grace Jenny. The couple had four children. Though the 1920s and 1930s, Bragg continued research into crystal structure using X-rays. As his father was conducting closely related research during this period, the two had to devise a program, however informal, to prevent the duplication of each other's work. Bragg was knighted in 1941. His father died in 1942. After World War II, Bragg returned to Cambridge, splitting the Cavendish Laboratory into research groups. He believed that the ideal research unit is one of six to twelve scientists and a few assistants. In 1948 Bragg became interested in the structure of proteins and was partly responsible for creating a group that used physics to solve biological problems. He played a major part in the 1953 discovery of the structure of DNA, in that he provided support to Francis Crick and James D. Watson who worked under his aegis at the Cavendish. Bragg was gratified to see that the X-ray method that he developed forty years before was at the heart of this profound insight into the nature of life itself. At the same time at the Cavendish Max Perutz was also doing his Nobel Prize winning work on the structure of haemoglobin. Bragg subsequently successfully lobbied for and nominated Crick, Watson and Maurice Wilkins for the 1962 Nobel Prize in Physiology or Medicine. In April 1953, Bragg accepted the job of Resident Professor at the Royal Institution in London. He proposed that the Royal Institution should perform some form of public service, and suggested a series of lectures to show experiments to schoolchildren. This idea was met with an enthusiastic response, and by 1965, 20,000 schoolchildren were attending these lectures each year. He worked at the Royal Institution until his retirement in September 1966. William Lawrence Bragg's hobbies included painting, literature and a lifelong interest in gardening. When he moved to London, he missed having a garden and so worked as a part-time gardener, unrecognized by his employer, until a guest at the house expressed surprise at seeing "Sir Lawrence" there. Bragg received both the Copley Medal and the Royal Medal of the Royal Society, and in 1967 was made a Companion of Honour by the Queen. He died at a hospital near his home at Waldringford on July 1, 1971. In 1912, Max von Laue, a German physicist, passed X-rays through a crystal, and by the resulting patterns left on X-ray sensitive media, demonstrated that the rays produced an interference pattern similar to that shown by light. He was not, however, able to explain the pattern by a clear theory of the atomic architecture of the crystals. Bragg successfully interpreted the interference patterns by assuming that the atoms that formed the crystals were arrayed in such a fashion that the faces with the greatest atomic densities formed parallel planes. The X-rays passed through these planes and formed interference patterns when they exited the crystal. He also corrected Laue's interpretation by suggesting a different type of atomic packing in the crystal structure. In one sweep, Bragg both explained the interference patterns and drew conclusions about the distribution of atoms in crystals, thus showing a way in which the crystals of other substances could be analyzed to determine the way in which their atoms are arrayed. Bragg was only 22 at the time of his discovery, and but a year out of graduate school. Bragg's father, William Henry Bragg, later developed a laboratory apparatus called the X-ray spectrometer, which simplified and systematized the analysis of crystals through X-ray diffraction. The two were awarded the Nobel Prize in 1915 for their accomplishments. Laue won the Nobel Prize in 1914 for his discoveries. William Lawrence Bragg could have been easily overshadowed by his father. In fact, when his son was a young boy and found a sea shell that represented a new species, the elder Bragg interfered and prevented the species from being named after him. In spite of this tendency to be overbearing and perhaps antagonistic to his son's achievements, the two were able to work together productively. Each was inspired and instructed by the other, and both produced independently their own discoveries in the same field. Their relationship demonstrates the mutual support that father and son, or a group of scientists, provide one another in their investigations when they work as a team. The use of X-ray spectroscopy was eventually applied to organic molecules, and was crucial to deciphering the complex double-helix structure of deoxyribonucleic acid (DNA), the fundamental molecule of heredity. The latter occurred some 40 years after Bragg and his father received the Nobel Prize for their accomplishments. Hunter, Graeme K. 2004. Light is a messenger: the life and science of William Lawrence Bragg. New York: Oxford. University Press. ISBN 019852921X. History of "William Lawrence Bragg"
This page was last modified on 21 October 2016, at 15:28.